Enter a world where everything is possible with KeyForge! Here, in this unique deck game, a world first, two players become archons forging keys that unlock the hidden vaults of the crucible, an artificial world built from pieces of countless planets. With an incredible array of creatures, artifacts and abilities, there are no two identical card games and two games will never be the same! Playing with the starting set of KeyForge is just the beginning of your adventures. You can expand your arsenal with decks, which each offer a complete gaming experience without the need to build a deck or extra boosters. Each deck is completely unique and can not be changed, which will require you to use all factions of your deck to win. Each deck has a distinct name and consists of a unique blend of maps, tactics, and strategic potential. In each pack, you will have the opportunity to become the best in the world by playing your decks. Will your teams have the strength, skills and cunning to win? Be careful this game is an extension of Keyforge: L'Appel des Archontes and cannot be played alone. 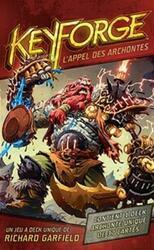 To be able to play it you must have a copy of the game Keyforge: L'Appel des Archontes .